I am Michael the Archangel. I am the angel of the Most High, created at the beginning of time to be the Protector of God’s purpose, empire, and position. I fiercely protect God and all of His creations. I am depicted by sword and by shield, each of which serves a purpose. They are not just ornamentation. Take my guidance, as I have God’s will as well as your best interests in mind. I have come at this time out of salvation for mankind. I am with you now to help you transition into the new world of Heaven on Earth, and that peace lay supreme for all. 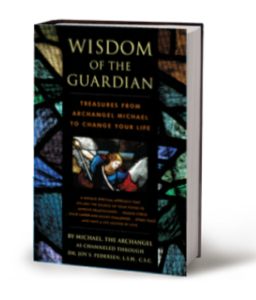 Archangel Michael appeared to Joy Pedersen in 2004 asking her to join him in a healing practice and to help write this book, “Wisdom of the Guardian: Treasures from Archangel Michael to Change Your Life”. As she had been channeling through automatic writing since 1994, her only question was how many chapters. Those 22 chapters and the following introduction came easily over 23 days as inspired. Over and over again, people struggle and search and reach out to me for answers, while the answers lie within. I am here to serve you, however, often you do not need my help. All you need do is look within to the I within. He is there to answer your every need; your every whim. I am here also, but you should not just rely on me. The I, your Source, is within you, each and every one of you. The same source lies within me as well. I am another vehicle to reach the Source but you do not need me. You can access the Source directly each and every time you feel you need to connect, you need an answer, you require a solution, or just want comfort. You have traveled a long and arduous path. You have struggled, wandered, returned, given up, gotten up, excelled, failed, rejoiced, fought, cried, laughed, smiled, won, lost, and on and on, over and over during the course of your existence. You have done none of it alone. We have all been with you, and the Source, without a doubt, has never left you. You may have left him, but he has never left you. But the search goes on, the questioning abounds. The doubts permeate your very existence. You wonder whether or not you believe in something greater than you or are you just fooled into believing in something that may or may not REALLY exist. We hear your cries, your doubts, your questions, you’re wondering whether or not there really is a God. You cry and blame him when something goes wrong. You laugh and cry when something goes right and you feel lucky. Nothing in either of those situations is different other than your lack of perception as to who you are, what your role is, and the impact your thoughts can have on a situation. What troubles me is that you miss the point. The point keeps getting drummed home over eons of time, but you continue to miss the point. The point is YOU ARE RESPONSIBLE FOR YOUR LIFE AND ITS OUTCOME. YOU CAN MAKE THE DIFFERENCE IN YOUR LIFE AND ITS OUTCOME. None of you are victims of circumstance. Each and every one of you has created the circumstances within which you live. You have either created them before you arrived here on this planet to learn a specific lesson in your spiritual growth, or you chose them once you arrived by default, by lack of correct thinking or by the actions that you’ve taken. At no time in history have the decisions you’ve made over eons of time been more prevalent. The reason is that this is the time when all is to be brought into balance. All is to be brought into right thinking, right action, and right being. All of you have the choice as to become one with the Source and live rightly or pay the consequences of not learning those right actions. There is more struggle today than ever before regarding inner turmoil experienced in the outer expression of those thoughts and feelings that dominate your mind. I will not sit still any longer and watch you struggle and blame others, most of all your Creator, and scramble and search outside of yourself looking for answers that lie within, which you keep missing. You are too close to the situation, so you keep looking outside yourself, while the answers lie within. They also lie in your circumstances if you look at them. LOOK AT THEM! You have created them. Why do you suppose you created them? To learn something. The purpose is to learn something from the mirror you place before your eyes of the circumstances you have created in order to understand yourself better. That is all. You have a choice in each moment of each circumstance to recognize and accept that you have created the circumstances before you. Or, you can blame others, or the world, or God, and continue to be the victim that you apparently relish being. How easy it would be to take full responsibility and have the power to make a change according to the circumstance and make it what you would prefer instead, by changing your thoughts and behavior. We are here to help you at this time to make this transition easier—to help you understand the world better and how to live in it easier. You have struggled long enough. It is time to spell things out for you, so that you fully comprehend and understand the parameters within which to operate and excel in your life. Life can get easier and easier by following the dictates the Source has put forth for your understanding, growth, and development. By following these dictates, you have the opportunity to excel, not only personally, but professionally, and economically as well. The time has come for people, all mankind, to operate from right thinking, right action, and right being. We are here to help you, one and all. All the heavens are here to support you in this endeavor. Books may be purchased from Amazon here. To order books from Publisher, go here. Books are fully returnable within 180 days of purchase. Chapter Twelve: Do You Want Peace? “This book is truly a treasure, as AA Michael presents the most profound understandings for all humanity to hear and embrace at this moment in time. I highly recommend Dr. Pedersen’s book for those on a spiritual journey, as they will surely feel more enlightened and hopeful. A true Masterpiece that one will want to read and re-read! !” − Melody S.
“Wisdom of the Guardian started me on my “Spiritual Journey” two years ago at age 60. I have grown in leaps and bounds ever since. This book can be found on my nightstand with my bible which came along afterwards. I constantly refer to it as a source of wisdom, guidance and inspiration. I have learned to understand myself better as well as how to approach life in a way that is for my highest good. I recommend this book to anyone who is seeking a better understanding of themselves as well as a primer to living a more fulfilling and meaningful life.” − Alan K.